(1) A horizontal force of 10 N acts on an object of mass 5 kg resting on a horizontal surface (Fig.). The object slides along the surface with an acceleration of 1.5 ms–2. What is the magnitude of the frictional force acting between the object and the surface? Since the acceleration of the object is 1.5 ms–2, the resultant force (F) acting on the object is 7.5 N, as obtained from the equation, F = ma where m is the mass (here 5 kg) and a is the acceleration (here 1.5 ms–2). As the applied force is 10 N, the magnitude of the opposing frictional force must be 10 N – 7.5 N = 2.5 N.
(2) An electron moves in a region of space where a constant electric field exists. Other fields in the region are negligible. 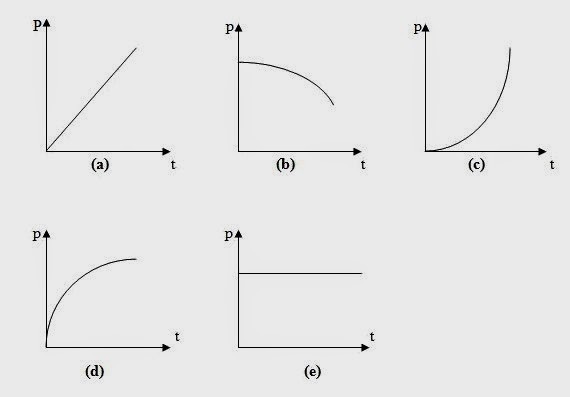 Which one among the following graphs shows the momentum (p) of the electron as a function of time (t)? Since the electric field is constant, the electric force acting on the electron is constant. By Newton’s second law, the force is equal to the rate of change of momentum. Therefore, the rate of change of momentum of the electron is constant. In other words, the slope of the momentum versus time graph must be constant. This means that the graph must be a straight line with non- zero slope. [If the slope is zero as is the case with the straight line graph shown in (e), the momentum is constant, meaning that there is no force on the electron. Graph (e) is therefore not the correct option]. Therefore, the correct graph is (a). (3) An object of mass m is resting on an inclined plane of inclination θ. The angle of friction between the object and the plane is 2θ and the coefficient of static friction is μ. What is the magnitude of the force of friction acting between the object and the inclined plane? The object will start sliding along the incline only if the angle of the incline is 2θ (since the angle of friction is 2θ). Since the object is resting on the inclined plane, the frictional force is just sufficient to counteract the component of weight of the object down the plane. This is equal to mg sinθ. Therefore, the correct option is (c). (4) If the object in question No.3 above just starts moving up the incline on applying an external force on it, what is the minimum magnitude of the external force? For making the object move up the incline, the component mg sinθ of its weight along the plane has certainly to be overcome. In addition, the frictional force μmg cosθ also has to be overcome. Therefore, the minimum magnitude of the external force to be applied on the object is (mg sinθ + μmg cosθ) as given in option (d). [Note that mg cosθ is the component of the weight of the object normal to the inclined plane and therefore μmg cosθ is the frictional force]. Since the firefighter is sliding down with an acceleration ‘a’, his weight as felt by the pole, is (mg – ma) = (750 – 150) N = 600 N.
The pole will exert an upward reaction force of magnitude 600 N on the firefighter. Equations to be remembered in this section can be seen here.